Are you an empty nester with a house full of furnishings you no longer need? Perhaps your kids are leaving home for college after finishing high school this year. In either case, there is no need to preserve your kids’ rooms for the occasional future visit. Why not use all the space you can to enjoy your own hobbies, exercise routines or perhaps install a home office? Here is how compact cabinet beds can help you reclaim all the square footage in your empty nest. Whether you have one, two or more spare bedrooms now that the kids are gone, there is no need to keep a traditional bed in any of them. A standard bed with box spring and mattress takes up a lot of space in the room. 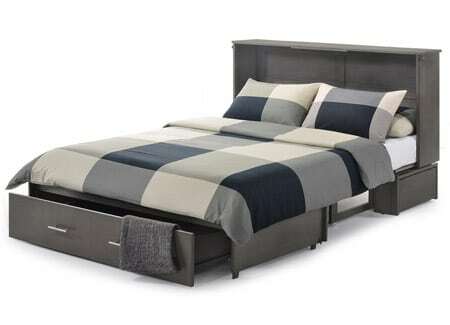 For a bed with queen-sized mattress (the most popular size), that means you are giving up over 30 square feet of space. Why allow a bed that is used only occasionally throughout the year to dominate the room? After you’ve cleaned out your now vacant bedroom(s), here are some suggestions for turning it into a room you can use and enjoy, thanks to the help of compact cabinet beds. How about a dedicated exercise room so you can (finally) get into shape, like you’ve been promising yourself for years? A workout room is best left as unfurnished as possible so that you have a broad area of unobstructed space in the middle of the floor. A cabinet bed pushed up against the wall takes up only about 10 square feet in the closed position. Additionally, the roomy storage drawer underneath makes an excellent spot to stow items like towels, yoga mats, exercise bands and arm weights. Then again, the newly vacated bedroom could easily become a hobby or craft room to indulge your passion for creation. You may want to place a large worktable in the middle of the room, which would be perfect for laying out fabric, photos, art supplies, scrapbooking papers and such. Line the walls with bookcases, shelving and cubbies that will help organize all your supplies. And, of course, use a cabinet bed to quickly transform your hobby room into a guestroom, as necessary. 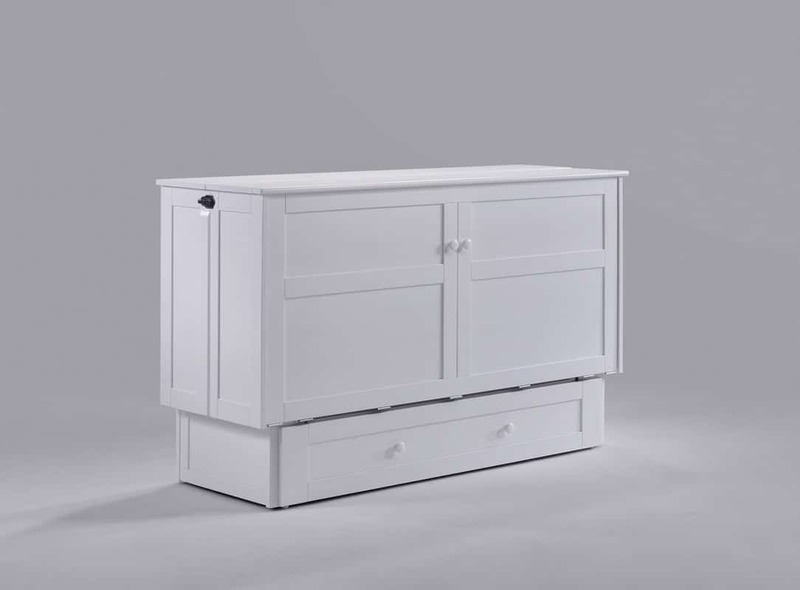 Simply pull the front of the cabinet bed down to access the mattress, which is queen-sized and made from premium gel and memory foam materials. The Sagebrush Cabinet Bed comes in a dusky, stonewash finish. 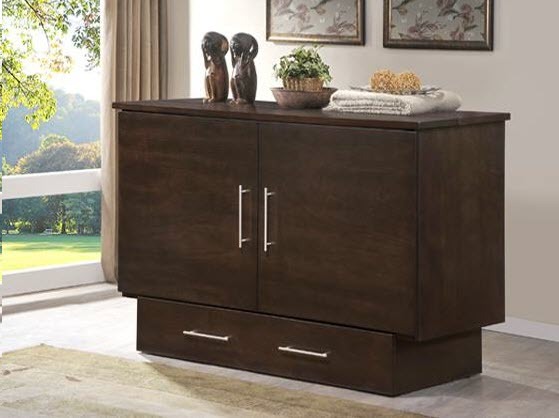 If it’s a home office you need to finally corral all your paperwork, receipts and files, then compact cabinet beds can easily be part of your new room. In addition to bookshelves, a desk and filing cabinets, the cabinet bed is a great place for storing items you frequently access, such as binders or reference volumes. They will fit neatly along the top of the cabinet. Be sure to place your desk nearby so you can use the handy USB and electrical outlet located along the front edge of some compact cabinet beds. And don’t forget that large storage drawer that makes a great place for storing extra office supplies. Isn’t it time you reclaimed the extra rooms in your empty nest? Compact cabinet beds are an excellent way to maximize square footage – and your enjoyment of whatever purpose the room will serve.